Well, hello, Mr. President. It looks like you have a variety of suits in your wardrobe. During a phone call with Russian President Vladimir Putin on Saturday (March 1), President Barack Obama stuck to the basics dressed in blue jeans and a denim shirt. Although we would say that his button-up is more of a gray chambray, it might as well be considered a modification of the Canadian tuxedo -- which for those of you who don't know, is a uniform comprised of all denim. Yep, denim on top AND bottom. However, the casual outfit has sparked some controversy as being "not up to the task" of a serious conversation about Ukraine with Putin, according to Ron Christie, a former adviser to President George W. Bush. Let's be real, while it might've been held in the Oval Office, it was a phone call... on a Saturday. 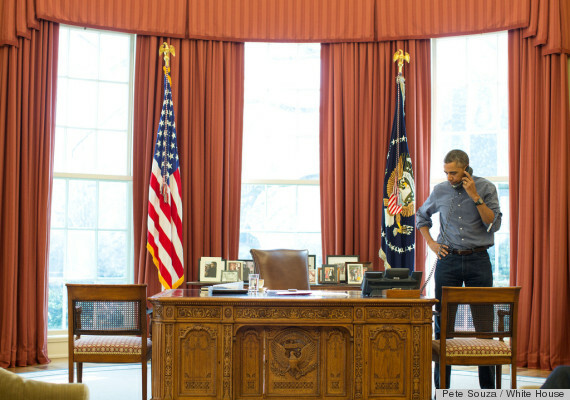 So, we think if President Obama wants to conduct some business in the comfort of a good pair of jeans, we're all for it. See Obama's outfit below and discuss.